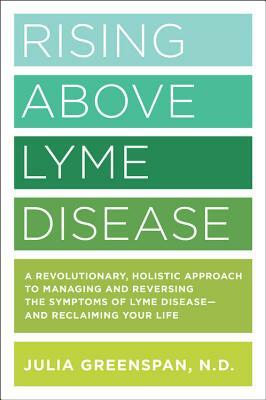 Rising Above Lyme Disease is a comprehensive, whole-body approach to overcoming Lyme disease and reclaiming your life. Incidence of Lyme disease is skyrocketing. If caught early, antibiotics can often successfully treat it, but more often than not, Lyme is asymptomatic and evades diagnosis until it is a full-blown, chronic condition that requires a multi-faceted treatment plan. In Rising Above Lyme Disease, renowned naturopath and Lyme-literate doctor Julia Greenspan presents a Comprehensive and Alternative Medicine (CAM) approach for recovery for those who have been suffering with this disease for weeks, months, years, or even decades. Operating from the front lines of the epidemic in New England, she gives hope to those who thought there was none, or feel unheard by all those around them. Through this comprehensive approach that focuses on the whole person and the very personal ways in which the disease may affect one's life, it is possible to find relief, become your best advocate, and ultimately, rise above Lyme. Julia Greenspan, N.D. runs the private medical practice Greenhouse Naturopathic Medicine, and has been treating patients for tick-borne disease in New Hampshire--one of the epicenters for Lyme disease--for more than ten years. She is a member of the International Lyme and Associated Disease Society (ILADS), the New Hampshire Association of Naturopathic Doctors, and the American Association of Naturopathic Physicians. Dr. Greenspan has a background in psychology and social work specializing in crisis management, and uses a personalized, multi-faceted approach in the treatment of Lyme and other diseases. She holds a Bachelors of Science degree in Psychology from Portland State University in Portland, Oregon and is a graduate of the National College of Natural Medicine. She served as the Chair for the Naturopathic Board of Examiners for the State of New Hampshire for five years and has been interviewed as an expert in Lyme disease on both radio and television, in addition to being published in the Naturopathic Doctor News and Review, the national publication for Naturopathic Physicians. She is a patient advocate, Lyme disease survivor, and mother of two.